This third edition of Job Creation and Local Economic Development examines the impact of technological progress on regional and local labour markets. It sheds light on widening regional gaps on job creation, workers education and skills, as well as inclusion in local economies. Drawing on new data, it examines the geographical distribution of the risk of automation and whether jobs lost to automation are compensated by the creation of jobs at lower risk of automation. Building on data from labour force surveys, the report looks at the rise of non-standard work, highlighting the main regional determinants of temporary jobs and self-employment. Finally, it considers determinants of productivity and inclusion in regional and local labour markets, as well as policies to foster greater inclusion of vulnerable groups into the labour market. Individual country profiles provide an overview of regional labour markets and, among other things, an assessment of the performance in terms of “quality” jobs created among different regions. 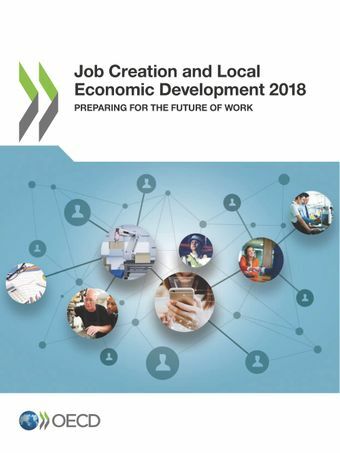 18/09/2018 - The 2018 edition of Job Creation and Local Economic Development was launched on 18 September 2018 at the OECD Forum for Local Development Practitioners, Entrepreneurs, and Social Innovators in Porto by Mari KIVINIEMI, Deputy Secretary-General of the OECD, Lamia KAMAL-CHAOUI, Director of the OECD Centre for Entrepreneurship, SMEs, Regions and Cities with Minister José António VIEIRA DA SILVA, Portuguese Minister of Labour, Solidarity & Social Security. For more information about this report, please contact David Bartolini. Journalists are invited to contact the OECD Media Division. Regional differences in employment are growing. In many OECD countries, 30% or more of jobs were created in the capital region, in the last decade. 14% of all jobs in OECD countries are at high risk of automation. How will local firms and their workers adapt to automation?